Thomas Carlyle and His Works is an essay written by Henry David Thoreau that praises the writings of Thomas Carlyle. 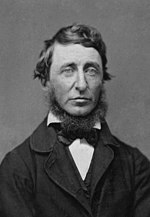 The essay demonstrates a few themes that show up elsewhere in Thoreau's writings. First of these is Thoreau's eagerness to find a hero. Carlyle wrote the book On Heroes, Hero-Worship, and The Heroic in History, which Thoreau considered his crowning achievement. While Thoreau as a young man was still looking for a hero to model himself after, he knew that ultimately he would have to cast models aside. He felt that the problem with religion was that when a Christ or a Buddha discovered something magnificent and important, people then spent their lives celebrating (or arguing about) the discovery but never bothering to try and discover it themselves. Thoreau appreciated the attitude of those who would not settle to think pre-conceived thoughts, but who instead wished to break out of the box of religious tradition and think independently for oneself. In Carlyle's case, Thoreau used this same appreciation to praise the "Carlylisms" that others found to be ostentatious: "He does not go to the dictionary, the word-book, but to the word-manufactory itself, and has made endless work for the lexicographers." Thoreau thought Carlyle to be of the "Reformer class" and that he had greatly contributed to humanity through his writings. One thing is certain – that we had best be doing something in good earnest henceforth forever; that's an indispensable philosophy. Thomas Carlyle and His Works at The Picket Line. This page was last edited on 8 April 2019, at 14:02 (UTC).